I first heard about this book when the author contacted me back in December last year to ask if I might be interested in reading her forthcoming novel. I was really intrigued by the idea of the story – following a sewing machine and its owners over the years – and the fact that it was set partly in Leith and other areas of Edinburgh sold it to me. I am so glad I said I would read it as I thoroughly enjoyed it. I was lucky enough to be able to go the launch of the book at Blackwell’s in Edinburgh on Thursday. The shop was packed, the books sold out and there was a huge signing queue. And there was special Sewing Machine gin! It was great to hear Natalie read parts of her book which introduced characters from the various eras in the book. She explained that if she is at a car boot sale or picks something up in a charity shop rather than being concerned with getting a bargain, she always wonders about the history of the object. Who owned it, where has it been, what is its story? And I was very intrigued to hear that there may have been objects in The Sewing Machine which might feature in future books – I’ll need to go back and try to spot them! Here are some photos from the evening – phone photos so please excuse the quality. Then read on for my review of the book. The idea of following the story of an object throughout the years is one that really appeals to me. In this case, we follow the journey of a Singer Sewing machine from when it was first built at the Singer factory in Clydebank in the early 20th century, through a few of its previous owners to the present owner, Fred, who has inherited it from his grandmother. We learn about Jean who worked at the sewing machine factory and Kathleen and her daughter Connie who kept a record of every item they sewed on the machine in small notebooks. 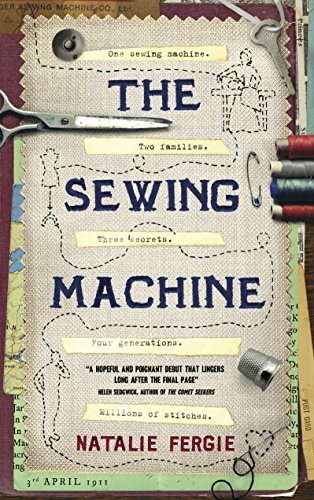 I really enjoyed that as well as following the sewing machine throughout the years we also learned about the rapidly changing social history of the time. The author has obviously carried out her research well as she brings to life what is was like to work in the sewing factory at a time when a mass strike was being called to improve the rights and conditions of workers. Through the characters of Connie and Ruth we learn about how nursing changed through the decades. The changing role of women and social attitudes also is explored as we follow the lives of Jean, Kathleen, Connie and Ruth. The were so many characters in this book who I warmed to but I must admit to having a soft spot for Connie and her husband Alfred. They are such a loving couple and some of their generous and kind actions brought a lump to my throat. In the present day story, their grandson Fred is also very likeable character and I liked the way we got to know him partly through his blogposts. The sewing machine is of course a rather important character in itself. As the storyline moved back and forward through the years, Natalie Fergie cleverly reveals a little of her characters’ lives at a time before finally revealing a long hidden secret. I must just mention how much I enjoyed the setting particularly the parts of the story set in Leith and Edinburgh. Although I live in Portobello now, I am a Leither by birth and it is seen as a very distinct part of Edinburgh. I could imagine my grandparents and great grandparents in the very parts of Leith mentioned in the story and visualise the living conditions described. I also had fun working out what parts of present day Leith Fred was walking through. I really wanted to think of some clever sewing imagery to sum up the book but the best I can come up with is that Natalie Fergie has skilfully drawn the threads of her story together to a very satisfying ending. Thankfully, she is much better at creating a wonderful story than I am at finding metaphors! More than 100 years after his grandmother’s sewing machine was made, Fred discovers a treasure trove of documents. His family history is laid out before him in a patchwork of unfamiliar handwriting and colourful seams. He starts to unpick the secrets of four generations, one stitch at a time. Beautiful review Joanne of a book which made my heart sing. Absolutely loved it too. Check out the book, The Sewing Machine, by Natalie Fergie, from this post on the Portobello Book Blog.